Revista is published by the David Rockefeller Center for Latin American Studies at Harvard. Spring 2013 is devoted to Panamá. 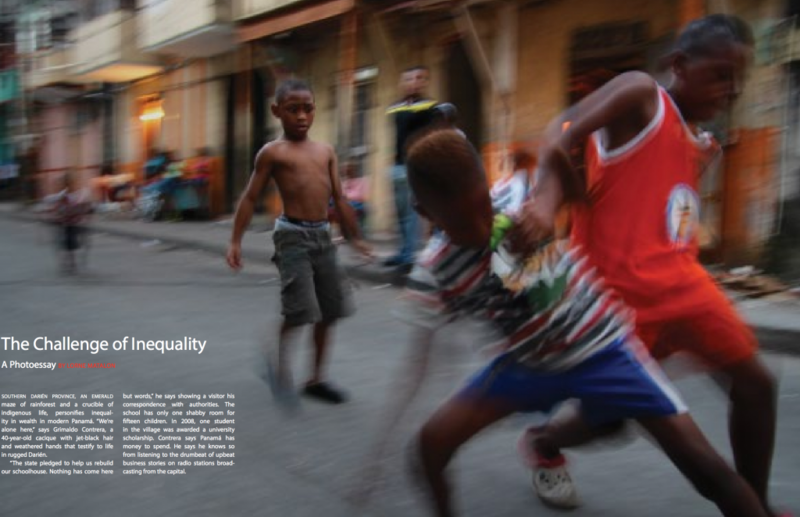 The Challenge of Inequality is a photo essay that delves into the double edged sword of a soaring economy in Panamá. Click here to read full PDF of photo essay. Click here to view full-screen slideshow. Southern Darién Province, an emerald maze of rainforest and a crucible of indigenous life, personifies inequality in wealth in modern Panamá. “We’re alone here,” says Grimaldo Contrera, a 40-year-old cacique with jet-black hair and weathered hands that testify to life in rugged Darién. “The state pledged to help us rebuild our schoolhouse. Nothing has come here but words,” he says showing a visitor his correspondence with authorities. The school has only one shabby room for fifteen children. In 2008, one student in the village was awarded a university scholarship. Contrera says Panamá has money to spend. He says he knows so from listening to the drumbeat of upbeat business stories on radio stations broadcasting from the capital. Yet, Panama’s education system is ranked 62nd out of 65 countries by the Organisation for Economic Cooperation and Development (OECD), an inter-governmental agency. 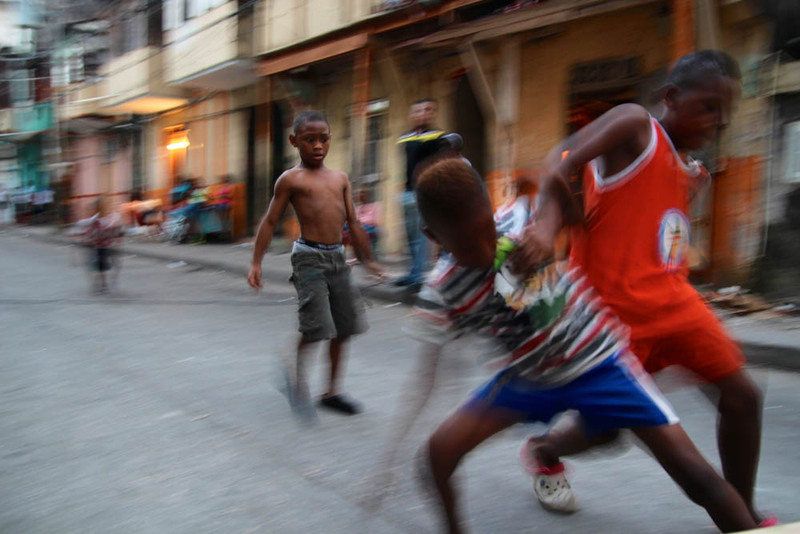 In villages like Contrera’s, in the urban slums and the coastal islands, the potential for upward mobility is frozen without a decent school. The United Nations says 32 percent of the country’s 3.6 million people live in poverty. The question isn’t always one of resources. The country is indeed growing by leaps and bounds—an average of nine percent annually for the last six years. Yet, President Ricardo Martinelli continues to face withering accusations of corruption. Low-income Panamanians widely believe funds that could be earmarked for education and social programs are going elsewhere. The government instituted $100 monthly payments to citizens over the age of 70 who don’t receive a pension. The government says 85,000 people are enrolled in the program. In Panamá, one hundred dollars is equal to about 25 percent of the country’s minimum wage, or 14 percent of its per capita GDP. Critics say that’s a meager payout given Panamá’s wealth. From the perspective of Panama City, the country’s potential to provide for all its citizens would seem limitless. Nests of construction cranes tower over creeping urban sprawl, and the canal is going through a major expansion. “We’re blessed,” says Captain Felipe Joseph, a lanky 54-year-old tugboat pilot on the Panama Canal. A lawyer and union leader, he represented canal workers as a member of the transition team that negotiated with the United States on the canal handover. Add to that economic palette the Zona Libre in Colón, the largest free zone in the Americas, an official currency of the U.S. dollar, an ambitious infrastructure expansion and the benefit of a strategic location at the intersection of two oceans and two continents. Roberto Brenes, head of the Panama Stock Exchange, says members of the business community, factions of organized labor and activists for the poor share a measure of disdain for the current administration. The business sector is increasingly agitated over allegations of corruption. The poor point to the allegations as examples of money diverted to entrenched special interests at the expense of social improvement. A family friend said the wedding cost upwards of US $200,000. The men and women serving the food on this night said they made four dollars an hour. Lorne Matalon is a contributor to the Fronteras Desk, an NPR initiative examining politics, demographics and the economy along the US-Mexico border. He is the former Mexico and Central America correspondent for The World, produced by the BBC World Service and NPR member station WGBH, Boston. This entry was posted in Print and tagged Harvard, Panama, ReVista. Bookmark the permalink.